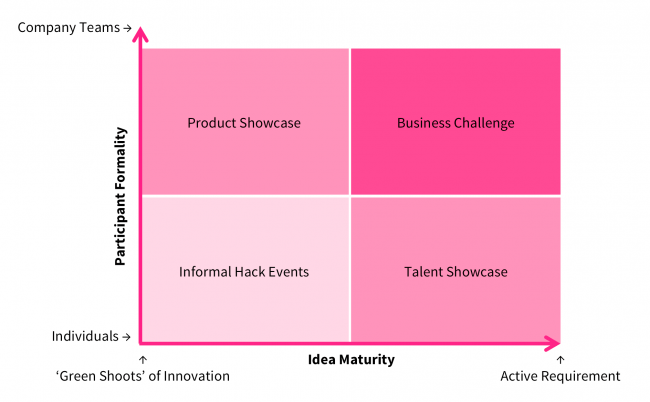 There are many ways to help organisations innovate and hackathons are often the go-to format; but are they always the most effective? This question underpinned a recent roundtable at the Digital Catapult entitled Hacked Off About Hackathons as part of their current ColLab Festival. There was an interesting group of organisations represented who all, in different ways, organise and run hackathons so there was much discussion about, amongst other things, whether it’s possible to build a hackathon framework or template for others to use. However the main point, which emerged through the discussions for me, was that there is no point organising a hackathon if it’s just a single day or weekend. It can’t merely be about having fun and looking cool. It needs to be integrated into a business need, an existing process and a clear strategy for it to have any chance of succeeding. David Dunn from the Digital Catapult in the North East and Tees Valley shared a useful framework below for when a hackathon can be useful verses other activities that fulfil a different role. I thought this was an interesting framework and one we could perhaps collectively build upon further. Start with an interesting question followed by intense bursts of activity – It never ceases to amaze me that workshops or hackathons are often underpinned by a dull or vague challenge. Time spent beforehand ensuring you have a good set of problems to solve is invaluable. Ensure that diverse perspectives are equally represented and heard – Every unfacilitated meeting ever (!) follows the Paereto principal namely that 20% of the people do 80% of the talking. Good innovation happens when different people can contribute in different ways equally so use tools and techniques (and a facilitator) who can ensure that this happens smoothly. Curate a programme an equal mixture of online and offline engagement – Good events are curated and cultivated, often invisibly, by an experienced team that can also respond well to events as they arise throughout. And this is as important to the digital engagement as it is the the face to face activites. When done well then the online and offline engagement can bounce off each other in really interesting and productive ways. Combine qualitative and quantitative analysis in iterative feedback loops – Similar to the previous point but it’s best to encourage and enable all participants to find lots of quick ways and opportunities to test their ideas quickly. This is invaluable and saves wasted effort. And this feedback should combine qualitative and quantative data sources equally wherever possible. There is no substitute for bold ambition and sheer hard graft – It’s an obvious point, but worth restating. Innovation events and hackathons are hard work from start to finish. They can be exhilarating and influential when well executed, but more than anything require participants to be present and to contribute which is not an easy thing to achieve. So aim high and be bold, as everything big starts small. My slides from the session are available to view here for reference. Lastly, I thought I’d share my favourite word that I learned at a side conversation at the session namely Wabi-sabi (侘寂) defined as “the acceptance of transience and imperfection” which seems oddly appropriate, in the context of open innovation in general and hackathons in particular. As ever we’d welcome any other top tips or lessons learned you may have learned about designing and running hackathons so please do share.